A recent feature about mistletoe, mistletoe berries, seeds and the growing season, from West Country Life, the Western Daily Press Saturday Magazine. Click the image to enlarge it in a new window. 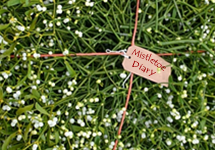 Spring is just about here, which means it’s almost the end of mistletoe berrying – cutting berries for propagation projects and for the mistletoe grow-kit business – for this season. Which is always something of a relief, after 6 months of life dominated by mistletoe queries, projects and talking, cutting, gathering, planting etc. Though I expect, after many years experience, that this will, as usual, make for a disconcertingly directionless few weeks at the start of April. But for the next 2 weeks the season goes on mainly, at this late stage, simply servicing the grow-kit demand, cutting berries to send out to wannabe mistletoe growers around the country. I say cutting, not picking, as we find that picked berries become, through being picked, damaged, with broken skin and oozing berry contents. And those deteriorate quickly, as well as just becoming a glutinous mess if posted en masse. So every berry is actually cut, using those tiny scissors made for florists, to retain a little bit of stalk, thereby keeping the berry intact. This is done with bunches of mistletoe cut from the tree, so it can be done in relative comfort indoors. But it does create an interesting new ‘leaning forward’ neck-ache, to add to the ‘craning-upwards’ neck-ache already prevalent after spending hours staring upwards and stretching to cut the mistletoe from the tree with an extending pruning pole. The seeds in the berries are, by now, itching to germinate, with the hypocotyl primordia showing as a small but prominent bulge on the seed. Within a few weeks any not planted will simply germinate within the berry, still on the parent plant – in a defiant final , but in their case pointless, effort to survive. By May any berries left on the parent will contain these tragic might-have-been mistletoes, their hypocotyls hopelessly extended and seeking a host branch yet doomed through being stuck, literally, within their own berry. have just moved to the north dordogne country park to live and have a couple of fruit trees in the garden literally dripping with mistletoe huge round bushes. I thought it was killing the trees and was going to rip it all off, but is it bad for the trees and can I do something more financially viable with the mistletoe? Look forward to your response.